Windswept Mirissa Beach, Sri Lanka. A tuk-tuk on Negomba Beach. Negomba Beach on Sri Lanka's Independence Day. 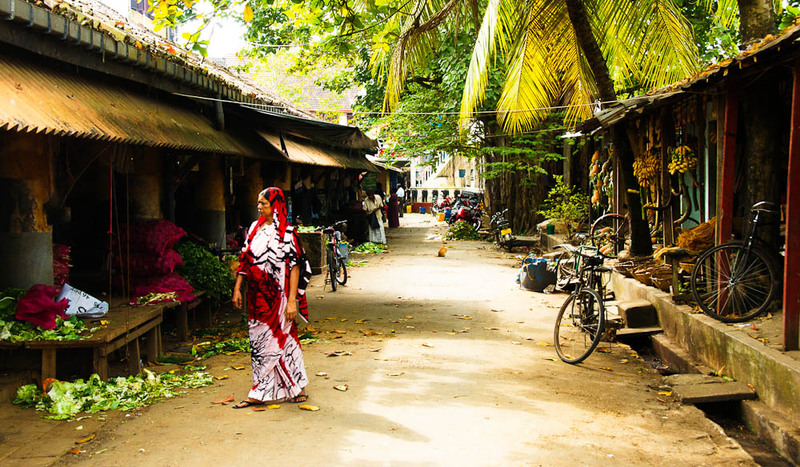 Laid-back local markets, Sri Lanka. 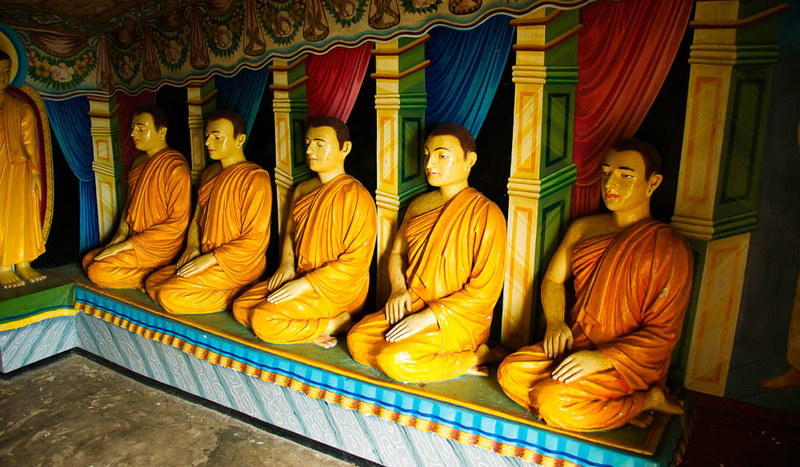 Statues of Buddha's monk disciples. Tea time at the sleepy town of Ella. Lance Richardson journeys from Sri Lanka’s shaggy coastline to the top of its holy mountain by tuk-tuk and train – with colonialism and curries in between. There’s no alcohol today, but the thousands of people on Negombo Beach are drunk on atmosphere alone. Some swim, the women fully clothed; others buy oily short eats from carts with ‘Masha Allah’ or ‘Power of Jesus’ stencilled on their sides. Where yesterday a snake-charmer spooked children with an uncoiling cobra, now there’s Sinhala tunes echoing across soccer games and drum circles. Soon a stage will spotlight dancing girls in saris. The British may have left Ceylon in 1948, but the locals have been celebrating ever since, throwing huge euphoric parties each year on 4 February – Independence Day. At the same time, history has been amended. The country is Sri Lanka again, its name in ancient epics like the Ramayana. And school children like to tell a fanciful tale that casts the British as pea-brained teachers: they came, taught cricket, and the Sri Lankans allowed them to stay only until they could be beaten at their own game. Then they were asked to leave. Such a story presents colonialism as a toothless anecdote, but it also reveals something about how Sri Lankans want to be seen by the world today – as shrewd, self-reliant, and equal to the larger powers. This is a country that has endured centuries of foreign rule. More recently was the 2004 tsunami, the greatest natural disaster in living memory. The quarter-century civil war has taken even more casualties; though it officially ended in 2009 it leaves an ethnic fissure that is yet to heal in the battered north. Sri Lanka is like a patient who has spent decades in the operating theatre, occasionally flat-lining. But now it’s rousing back to consciousness with the vigour of a newborn. Travellers often beeline for Colombo after landing at the airport. 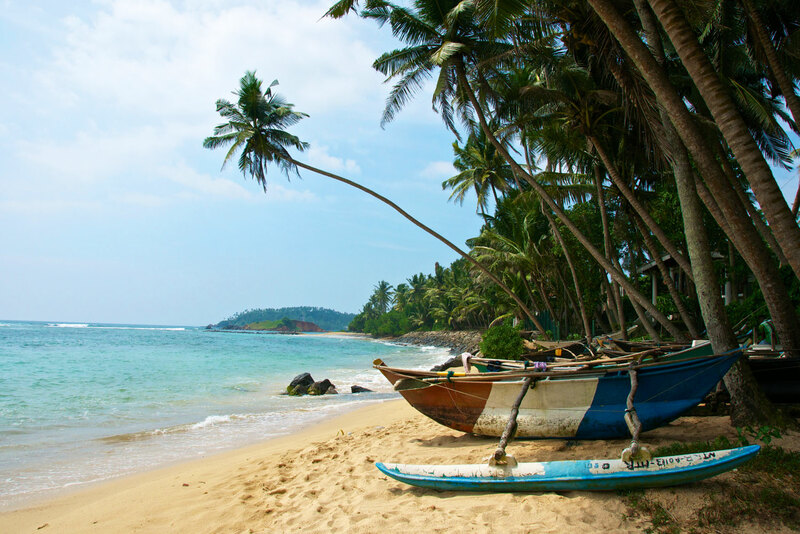 But a better introduction can be found slightly north, at this shaggy beach town of Negombo. It sets the scene perfectly, on Independence Day or any day at all – the laid-back lifestyle, the gaudy colour palette, the fragrant tang of cardamom and cumin drowned in coconut milk. Negombo slows the heartbeat to Sri Lankan speed, a necessary adjustment, because travelling here takes a lot of time. Partly this is because the beaches are so hard to leave. Travelling south past Colombo and Galle all the way to wind-swept Tangalle, this coastline is postcard Sri Lanka, with languorous palms, crab curry, and dark crows circling above white dagobas. But the country’s fortunes are on the rise now, and there’s a great deal more to see. This trip is all about ascents – up into the mountains called the Hill Country, all the way to the very top of Sri Pada (‘Adam’s Peak’), the most sacred site of them all. The village of Ella has emerged as the defacto visitor’s capital of the Hill Country. To reach it from the south I board a bus in Tangalle, change at Wellawaya, and rumble up a vertigo-inducing series of switchbacks. Ella is perched at the top, gazing down on the blue coast through a gap in the mountains that creates a natural frame. In clear weather the view is astounding, but today the town’s inclined main street is muddy, its lights on the fritz as the power supply struggles against the rain. This sort of comment is usually dispiriting when you haven’t booked in advance, but Sri Lanka’s sudden popularity has given rise to a class of savvy entrepreneurs. You can trust your luck to traditional hotels, scouring the internet; or you can allow yourself to be swept along on a current of suggestions, spreading money to the people who need it most. I tell the driver I’m looking for a room too, but one away from this bustling thoroughfare – a home-stay perhaps? The driver takes me to his friend S. M. (Namal) Priyantha, who runs the aptly named Great View Inn, a modest but comfortable addition to his family home. Twenty minutes later I’m standing on a rose-lined terrace overlooking Ravana Falls. As Priyantha points out the hot water and mosquito net, his little girl delivers tea with barely suppressed ecstasy. She lifts the lid off the sugar and explodes into giggles. I draw a map of Australia in their guestbook. Often the infrastructure of travel separates visitors from the local people; the tourist exists in a sort of parallel world. 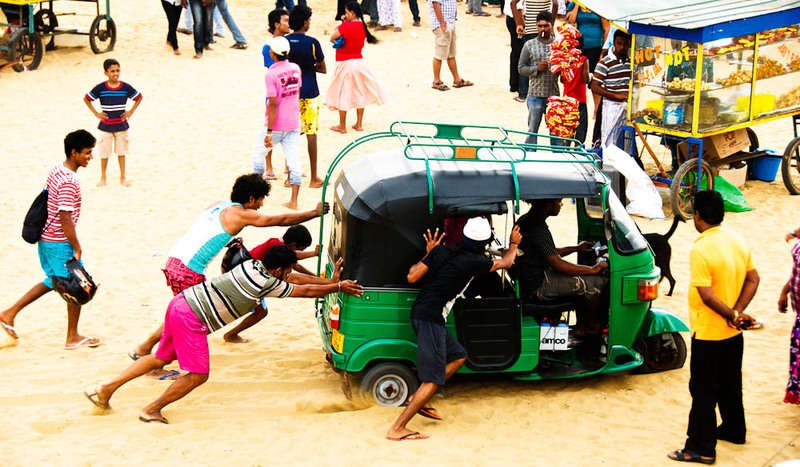 Sri Lanka is different: you can find the thick of everyday life with very little effort here. I hire Priyantha asking him for the insider’s guide to his Buddhist temple, the nearest tea plantation, the best rice and curry going. This is how I end up at the Dowa temple with its 2000-year old Buddha etched into stone; and an Ayurvedic spa called Suwamedura, where a man rubs coconut oil into my head as the lights fritz again over images of Shiva. 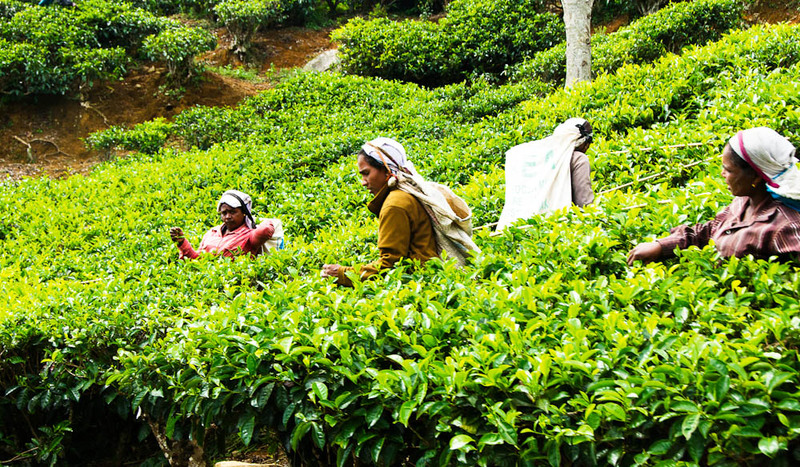 Priyantha also recommends Haplewatte Tea for a tour of the factory and a taste-test. The prevalence of tea means I’m often conscious of the ghostly presence of the British, their obsession with the drink having transformed this landscape into a green carpet of almost uncanny neatness. In Nuwara Eliya (once called ‘Little England’), where I spend a night shortly after leaving Ella, ‘Edinburgh’ is lettered across a field of tea bushes. There’s a manicured Victoria Park, with hothouses and a rose walk, and a prim golf course (“Probably the best golf course,” an ambivalent sign says). Not to mention the legendary Hill Club, built in 1885 and resembling a cross between Downton Abbey and Frankenfurter’s castle from The Rocky Horror Picture Show. I’m forced to wear a musty jacket to dine beneath game trophies. The soup is from a tin and the chocolate cake is finished with artificial cream. It would seem grotesque were it not hilarious, like a museum lost in translation. Most everywhere else the Sri Lankans have taken the British legacy and created something new. 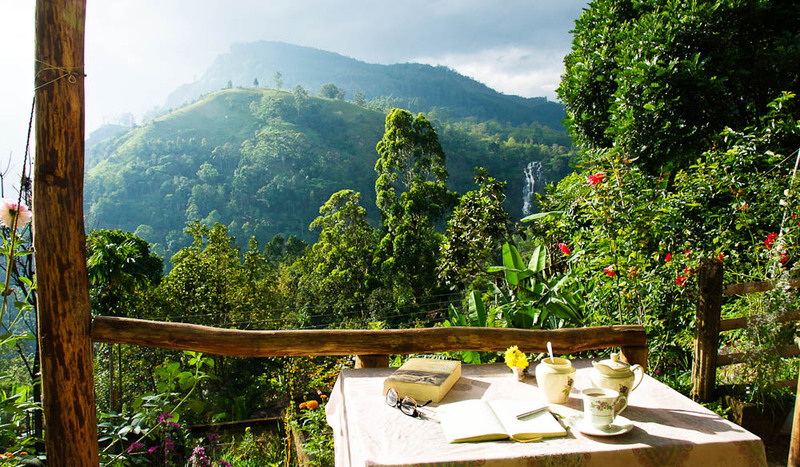 In Haputale, just before Nuwara Eliya, the tea factories remain the driving force of town – but it is a thoroughly Sri Lankan town, like a ramshackle bazaar with stray dogs sunbathing in the middle of the road. When I catch the train between these places – Ella, Haputale, then Nuwara Eliya – I’m grateful for the leftover remnants of colonialism, because the train is a pleasure, floating along the hill crests like a cloud. But the things I like most are the tunnels, which Sri Lankan children treat as a game: they lean out the carriage doors and scream. “Ghost train,” one attendant offers by way of explanation. We clear the tunnel and the children howl with laughter, running down the aisle. A man walks past selling curried prawns and peanuts. At Hatton station a bus waits to collect pilgrims; from here it’s a thrilling ride through tea fields terraced around the shores of Castlereagh Reservoir. Eventually we land up in Dalhousie, a carnival sideshow masquerading as a town. Everything else unfolds like a vivid dream. It’s 2:00am when I wake to climb the mountain. Sri Pada looms above, a single vein of light illuminating 5200 steps. Surrounded by old women and monks in saffron robes, it takes more than six hours because the staircase narrows dramatically, causing a bottleneck of devotees. But there are teahouses to rest in and a buoyant atmosphere. By the time the sun rises, spilling gold, I am high above the cloud-line crouched in silence. The Buddhists believe that Buddha stepped on the top of Sri Pada, leaving his footprint; Hindus insist it was Shiva; Christians believe St Thomas; and Muslims say the print was left by Adam stepping down from Eden. Everybody makes the journey together. In a way this feels like Sri Lanka summed up: stunning diversity crammed into a single small space. And it reminds me later of something I read in an old guidebook. “What you get from it depends on what you bring,” writes Arthur C. Clarke, the British novelist who lived in Sri Lanka until he died. Places change over time, but when it comes to Sri Lanka that sentiment seems both vital and true, particularly now, as the sun rises higher and this tiny island shaped like a teardrop comes into its own again. Much of Sri Lanka experiences only a wet and dry season. The best time to travel on the south coast and around the Hill Country is between December and May. You don’t need a lot of money to find a comfortable room with hot water and a mosquito net. Asking around will lead to terrific home-stays that won’t be listed in guidebooks. Otherwise try these options. The best food can be found in home-stays and nondescript local eateries. Be sure to try kothu rotti, curry, string hoppers and short eats. Otherwise try The Hill Club – a hit-and-miss European cuisine but an entertaining time-warp with friends. 29 Grand Hotel Rd, Nuwara Eliya; +94 52 222 2653. Egg hoppers are one of the great culinary pleasures of Sri Lanka: a cupped pancake, fried with egg and served up alongside chilli sambol. Perfect for breakfast. Near Ella, the little-visited Dowa Temple is home to a 2000-year-old Buddha carved from stone. 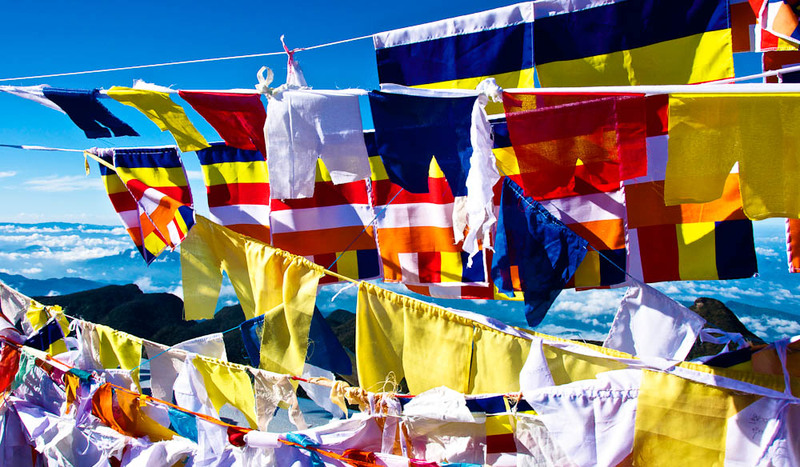 Water the bodhi tree and light a candle. Slow the arduous ascent up Sri Pada (Adam’s Peak) with an early-morning rest at a teahouse. 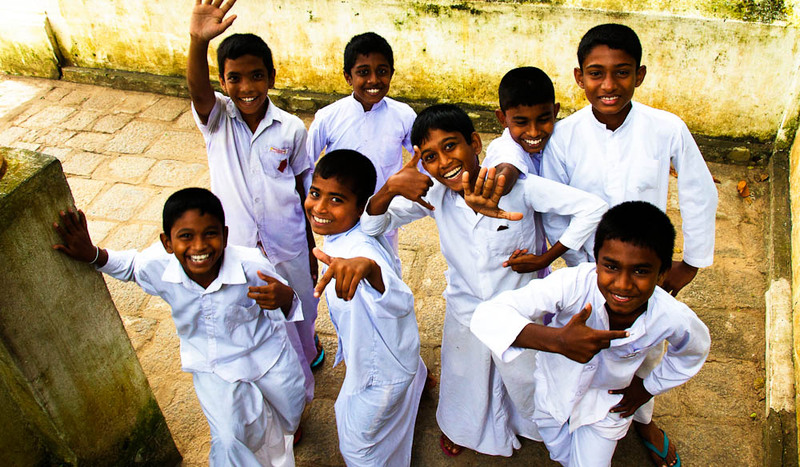 Sri Lanka rewards curiosity. Don’t be afraid to seek advice from locals and get off the beaten track. Bus travel is incredibly convenient, but the dance music pumped through bus speakers can shred nerves without earplugs, so don’t forget to bring them for longer trips. Female travellers can be hassled here. Advances almost never go beyond catcalls, but women should exercise caution, particularly in the evenings. The country grinds to a halt on poya (full moon) days, when alcohol is prohibited and many businesses close. Avoid climbing Sri Pada on a poya day. 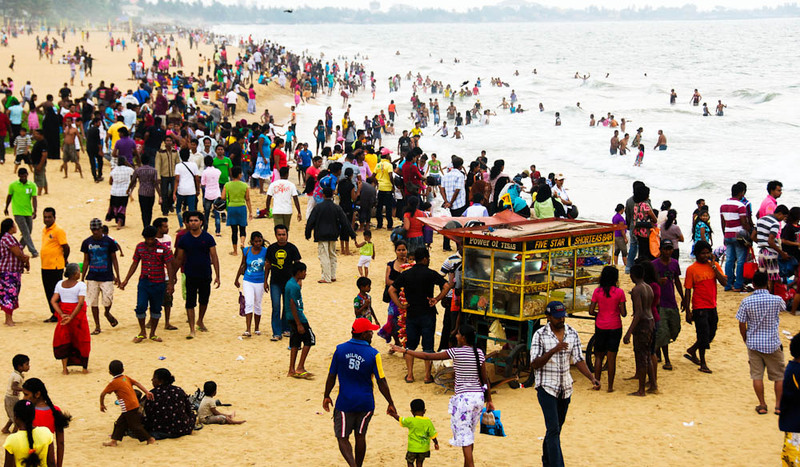 Sri Lanka is currently booming as a travel destination. This means ballooning prices as local vendors push the limits of what people are willing to pay. Don’t be afraid to negotiate, but expect prices to be higher and in some cases double than those listed in guidebooks.